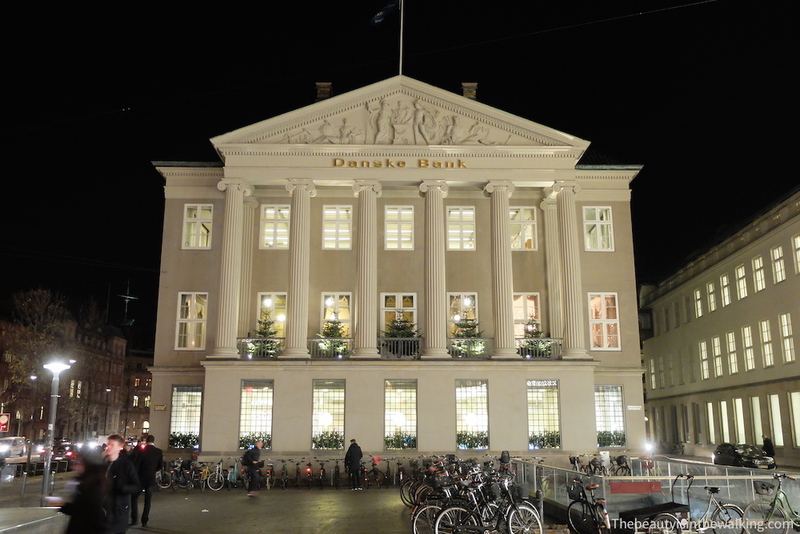 We were lucky to visit the Erichsen’s Mansion, a historic building located at Kongens Nytorv (New Royal Square) in central Copenhagen, which currently houses the Danske Bank Heaquarters. That was a unique opportunity for us to get into it and discover its sumptuous interiors while listening to some history and anecdotes. Erich Erichsen (1752-1837) was a banker, merchant and ship-owner. He was born in Odense (on Funen Island – a small island West of Copenhagen’s) and came to Copenhagen in the late 1800’s to take part of the trading boom. Within a few years he became one of the leading entrepreneurs and had vessels in harbours all over Europe and the Far East. In 1795, as Copenhagen was destroyed by a huge fire, he decided to build a new home for himself and hired Danish neoclassical architect Caspar Frederik Harsdørffer, well known in Denmark at that time to make the most fashionable building of the period. Yep, that was the trendiest mansion you could live in back then. Three years before he died, Erichsen had to sell it because of financial difficulties. It then became a hotel, and after that a furniture showroom before it was sold to the bank Kjøbenhavns Handelsbank in 1888, which later merged with Danske Bank. The Mansion has been used as offices and meeting rooms by both banks since that date (however in March 2016, the Bank sold its buildings to Standard Life Company). This neoclassical-style Mansion was built in 1800. It became a historical preserved building in 1918, like a few other buildings located along the Holmens Kanal. It has the particularity to be the first citizen’s house with full columns (as you can see on the building’s front facade) as before that they were exclusively reserved to the royal and noble residences. And just for the anecdote, the imposing temple-style front faces Kongens Nytorv (and not the canal) because not only Erichsen particularly liked this square but also because the canal flowing by the side of the building was so dirty at that time (no waste management back then) that he wanted to avoid facing such unpleasant view and smells. Also, the top triangle of the frontage features mythological characters: Minerva (the goddess of art, science and craft) shakes the hand of Mercury (the god of commerce and navigation). No less! The other figures are symbols of the sky and the sea. The interior design was made by French neoclassical architect, interior designer and landscape architect Joseph-Jacques Ramée, and executed by a team of artists among which French painter Pierre-Etienne le Sueur who was working as a scenery painter at the close-by Royal Theatre. Layers of painting from the previous renovations. The decorations. The wall paintings and sculptures were inspired by the 2000-year-old murals of Pompeii, south of Rome. It’s a beautiful mixture of landscapes, gods and goddesses, as well as female figures and animals. Of course some decorations may look a little overdone, but the wall paintings are heavenly beautiful, full of interesting details and meanings. All that gives so much charm to the rooms and makes it an incredible workspace for the employees of the bank as they can use them for meetings or to find an even calmer place to concentrate. Painting of the bedroom’s ceiling. The furniture and antiques. They are actually newer than the Erichsen’s Mansion and were brought here by Handelsbanken in the 1960’s. It’s an absolute gorgeous collection of pieces of art, and it matches perfectly the style of the Mansion. Our favourite pieces were the crystal chandeliers of various styles and the wall lamps with pretty details, not to mention some wooden chairs. We had the opportunity to visit Erichsen’s Mansion thanks to the French Association Copenhague Accueil and to one of its members who works for the bank and organised a tour for us. We are grateful to Danske Bank, which gave us a free guided tour and occasionally opens its doors to the public to share this beautiful heritage, not to mention that they have taken care of it all these years. Do you like that kind of places?